This post collection of BMW F30 coding reference guide,include FA code and CAFD code coding.Hope it helps! Active High Beam Assistant (Anti-Dazzle) requires the vehicle to be equipped with High Beam Assistant. This enabled the system to enable high beams to dodge vehicles by independently moving the high beams around in each headlight without blinding other drivers. MODIFY THE READ FA-Remove 5AP from the vehicle FA. VO CODE-FEM_BODY and FLA/KAFAS2 (whichever you are equipped with). It is recommended, if not, possibly required to enable Variable Light Distribution in order to have Active High Beam Assistant become fully active. Instructions are below for enabling Variable Light Distribution. Variable Light Distribution requires a FLA/KAFAS camera to be installed in the vehicle. This allows the light beam to adapt according to vehicle speed. When driving in the city, a low beam is used to beber illuminate the road immediately ahead without dazzling oncoming drivers. Then at higher speeds, the headlamps are raised to increase visibility. MODIFY THE READ FA-Remove 8S4 from the vehicle FA. 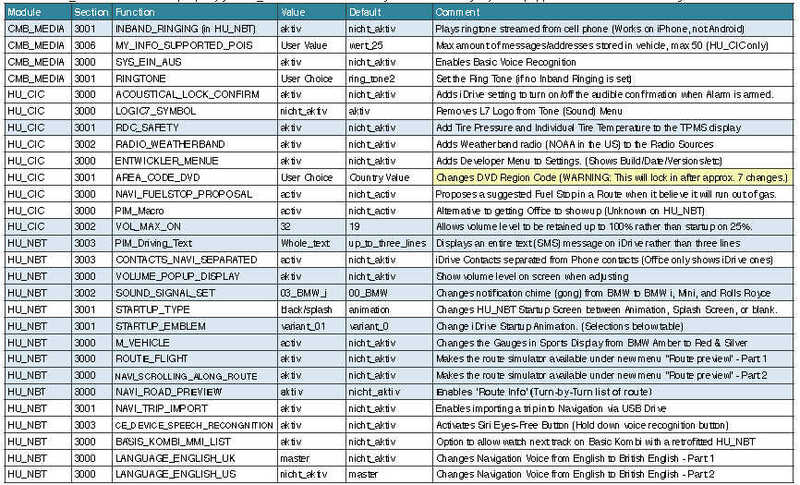 Enhanced Bluetooth requires the vehicle to be equipped with HU_NBT or have a combox if you have HU_CIC or HU_ENTRY. This enables you to stream audio via Bluetooth, enable artwork, and USB stream music as well. If 6NH doesn’t exist, add either 6NK of 6NS. MODIFY THE READ FA-Change 6NH to 6NK (w/o BMW Assist) or 6NS (w/ BMW Assist) from the vehicle FA. VO CODE-CMB_MEDIA and HU_CIC/HU_ENTRY or HU_NBT. MODIFY THE READ FA-Remove Country Controller code (SL8Ax) from the vehicle FA. Sport Automation Transmission (SAT) is a standalone option offered by BMW, with paddle shiLers (though no required). This will enable to have faster, and claimed smoother shifts with you ZF8HP Transmission. This will also enable Sport+, if not already active. MODIFY THE READ FA-Change 205 to 2TB from the vehicle FA. VO CODE-EGS, ICM, and KOMBI. Fog lights illuminate in the steered direcKon. **Front Fog Lights are required for all features below**. Rear Fog Lights require a working Rear Fog Light Button, which can be done by using the plastic piece in place of the button and breaking the plastic stopper inside the piece. No parts need to be bought. These are features that vary between all the iDrive functions (Vehicle Status, Navigation, Sound Sevngs, etc.) grouped by relativity. **Note: CMB_MEDIA codes may or may not be under the HU_NBT module, since the combox is integrated in HU_NBT. 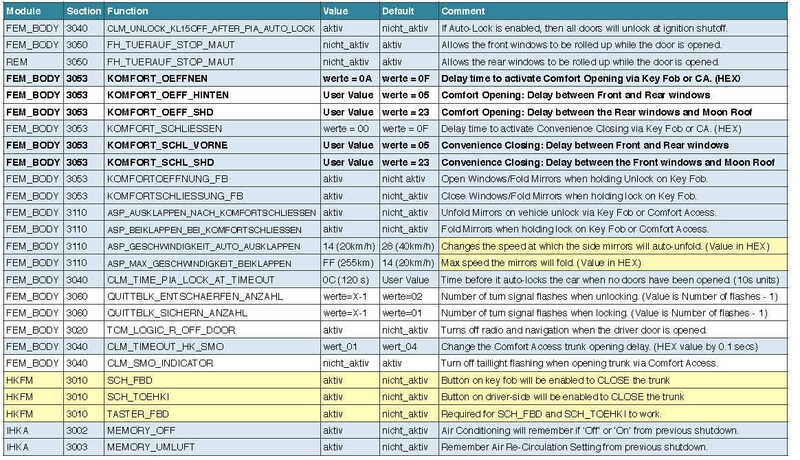 **Not all HU_CIC codes will work properly for HU_NBT and vice-­‐versa, so if it’s not labeled for your equipped head unit, there is no guarantee it will work. Video in Motion is NOT available on HU_ENTRY. You must have HU_CIC or HU_NBT. 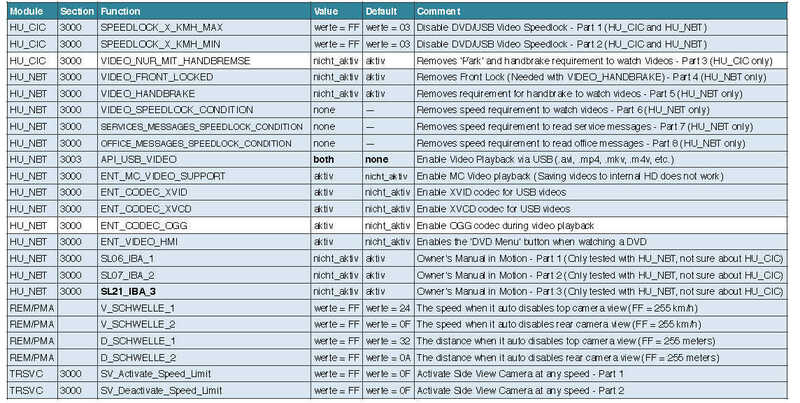 *USB Video playback should already be enabled in HU_NBT. To actively change routes based on Traffic, enable Traffic Info under Options in Navigation and enable Dynamic Guidance in Route Preferences. Cold Weather Package/Heated Front Seats Required. The values are all temperatures in HEX. The conversion: ([Desired Celsius Temperature]+40)*2. Ex. I want 106º F, and 106º F = 41º C. So my value will be (41+40)*2 = 162 (decimal) = A2 (HEX). **This will only work if you are equipped with Headlamp Washers, in the Cold Weather Package** Most of these functions should work or change as labeled. However, I have yet to go through testing with these.